Powers/Abilities: Unos had several magic powers. He could shot crimson beams from his eyes, which dissolved skin, flesh and bones, leaving behind only dust. Using magic he could find a person in a town. He could increase strength, stamina and speed of creatures, like horses. He could cast simple illusions of himself, appearing in a place near where he actually was. With simple hand gestures he could lift little objects like stones or swords and launch them. He could break the ground, creating a crevasse, and could entangle his adversaries by animating plants and roots. He could also detect if enchantements were at work on persons near him. History: (Conan the Barbarian I#50 (fb) - BTS/(Conan the Barbarian I#51 (fb) - BTS ) - In Alkarion, two wizards of the court, sought to take control of the land. In a plan to depose the regent, Themas Herklar, they created Unos. Unos was a creature of wizardry. Son of two demons, Belthamquar and Thelonia, his flesh was made by the two wizards using forbidden elixirs. He was given sorcerous powers. Then, the wizards Elviriom and Thalkalides, declared that Herklar was a traitor and placed Unos in his position. Unos became ruler of Phalkar and the two wizards manipulated Unos. (Conan the Barbarian I#50) - Elviriom and Thalkalides ordered to invade the near province of Kaddonia. The general of the army, Jarkan Val, did not execute the order, because it did not come from his ruler Herklar. Once in the king's court, Unos, revealed to Val as the new ruler, showed to Val his demonic power. Absolutely expressing no feelings, Unos shot deadly burning beams from his crimson eyes. The beams hit a condemned man and his body was nearly disintegrated, from flesh to bones. That night, the two sorcerers and Unos sent some yellow, devil-things servants down to the prison where Themas Herklar was kept. There the devils found the ex-regent and Conan. The latter succeeded in escaping while the former was taken and killed. 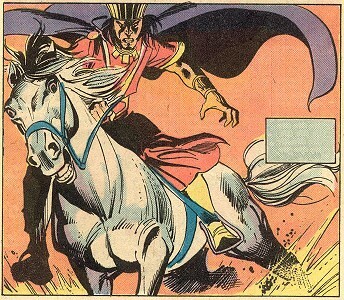 (Conan the Barbarian I#51 (fb) - BTS) - Despite his power, Unos was afraid of Elviriom and Thalkalides, who had powers greater than his and could also summon demons like Azthamur of the hundred hells. (Conan the Barbarian I#51) - Some days later, while receiving the people at the Temple of Judgment, Unos met Conan and a golden, three-eyed pol. The bird was actually Samandra, and before the court it exposed the murder of King Thormond caused by Elviriom and Unos' true nature as a creature wizardry, who was merely a puppet of Elviriom and Thalkalides, and finally it revealed that the true heir to the throne, Stefanya, was still alive. Unos let Conan and the bird live, against the will of his two wizards. Shortly after, Unos used his powers to find Conan in Alkarion. He wanted to talk again with the pol, instead he found Samandra. Understanding that she was the pol, he accepted her help for defeating Elviriom and Thalkalides. He watched while Samandra summoned two demons from the cosmic cold. Belthamquar and Thelonia arrived, and recognized their son Unos, who asked for their help and they accepted, but just for this one time. In that moment Elviriom and Thalkalides arrived and the two demons attacked. Smiling coldly, Unos watched while Elviriom was killed and Thalkalides was transfomred into a humanoid toad. Thelonia took Thalkalides to her hell, then Unos' parents left. In return Unos stabbed Samandra in the back. With the death of Elviriom and Thalkalides, Unos inherited many of their powers, now the only threat to the throne of Phalkar was Stefanya. Fortunately, Conan had fled with the heir to the throne: Stefanya, daughter of King Thormond and Lady Chrysala. Conan wanted to reach the body of Zoqquanor, the necromancer, who had protected Stefanya for many years, but Unos pursued to kill them. Conan and Stefanya had just retrieved Zoqquanor's body, when Unos reached them. Unos directed his gaze of scarlet hellfires upon Conan, but he failed, for the barbarian wore a protective amulet made by Merdoramon. He then used his telekinesis to disarm Conan. Unos untangled Conan with animated roots, then redirected his attention to Stefanya. The demons' son felt that he couldn't kill Stefanya with his blade, due to a protective curse casted by Zoqquanor, so he shot his burning crimson gaze upon the necromancer. The conjurer died and Stefanya screamed in agony. Enraged, Conan freed himself and embraced Unos in a mighty clinch, unwittingly using the amulet. Unos screamed only once, then died, with a mark of azure flame on his chest. Belthamquar, father of demons, was a powerful demon coming from an unspecified netherworld. One of his sons was Unos. He knew other demons, Azthamur of the hundred hells was one of them, who Belthamquar considered an upstart. Outside his world, Belthamquar seemed without a solid shape, and was only seen as a cloud of darkness with blazing eyes. He could control his shape, moving tendrils like fingers and his touch could be deadly, but the real extent of their powers remains unrevealed, tough it was far greater than the power of the wizards, who summoned him. Thelonia and Belthamquar were summoned several times by Elviriom and Thalkalides. Belthamquar did not like to be summoned outside his world so the wizards often made sacrifices to him and Thelonia. The last time Belthamquar was summoned by Samandra and saw his son he was not so satisfied by Unos. He nonetheless agreed to help him and grasped Elviriom with his black tentacles pulled away the sorcerer's flesh and soul into some outer blackness leaving behind only a puddle of water. Belthamquar and Thelonia left, vowing to never aid their son again. Thelonia, mother of demons, was a female demon coming from an unspecified netherworld. One of her sons was Unos. She could control the shape of other beings, but the real extent of her powers remains unrevealed, tough it was far greater than the power of the wizards who summoned her. Thelonia and Belthamquar were summoned several times by Elviriom and Thalkalides, who also made sacrifices to them. When she was summoned by Samandra she greeted Unos and accepted to help him, but only once. 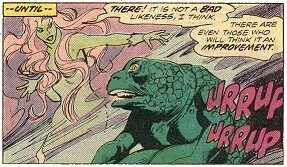 She attacked Thalkalides, touching him and transforming the wizard into a toad-like humanoid. Then Thelonia left, taking Thalkalides with her for the amusement of her court. While Belthamquar and Thelonia left, they vowed to never aid their son again.